Klipsch R-20B review | What Hi-Fi? It’s been a while since we tested anything from Klipsch’s home cinema line-up, but with its new Reference range hitting the shelves, it seems like the perfect time to take a fresh look. Sitting just below the pricier Reference II Series, the new Reference line-up is made up of a standard home cinema package and two soundbars, the R-10B and R-20B. It’s the flagship R-20B we’re concentrating on here: a soundbar and subwoofer duo wading in at a price-point to take on Dali and Yamaha in this increasingly competitive world. Design-wise it doesn’t stand out like the Dali Kubik One or the Focal Dimension, but it’s certainly smart, and its smaller footprint will appeal to those lacking space. That said, the Klipsch does comes with a separate side-firing subwoofer, but its wireless nature helps you be more flexible with its placement thanks to its 15m-range. At just over one metre wide, the R-20B is probably best suited for use with TVs up to around 50in, and since it’s not overly tall you might be able to get away with sitting it underneath your screen if you don’t have a whole shelf on your rack to give up to it. Of course, it can be wall mounted and there’s a template included in the box. Inside the slender body of the R-20B is considerable power, with four 76mm midrange drivers and two 19mm dome tweeters, supported by a 25cm bass driver in the solidly built sub. The tweeters take on Klipsch’s tried-and-tested ‘horn-loading’ technology, which sees them connected to a horn-shaped device with the aim of more efficient sound transfer between drive unit and air in front of it. Klipsch has also added aptX Bluetooth technology for using the R-20B to playback music from compatible portable devices, and overall set-up is admirably straightforward: you have the option of an optical or line-in connection, with an optical cable included in the box to get you up and running right away. No HDMI also means the R-20B won’t be able to decode the most advanced of audio codecs either but, for the majority of people and situations, optical should have you covered. Switch the sub on and it connects to the soundbar automatically via Bluetooth. It’s seamless, finding the soundbar within seconds; an LED on its back panel lights up to show when it has connected successfully. We start with Gravity, and one of our favourite test scenes: Kowalski and Stone colliding with the ISS. There’s no doubting the power on offer, and even at lower volumes it does a good job of filling our test room with full-bodied and detailed sound, if not very subtly. When it comes to cranking up the drama though, you don’t have to ask the Klipsch twice. As the pair twists towards the ISS with no brakes to cushion their fall, the R-20B jumps into life - and when they do eventually collide, there’s a real weight and solidity behind the impact. In fact, there’s great integration between the bass and the bar that makes their partnership almost undetectable. If we’re nitpicking, we’d have the bass a tad more taut, but it’s far from a deal-breaker. What’s more troublesome is a touch of brightness that upsets the balance in the upper-midrange and treble. Switch to Fast & Furious 6 and while there’s no doubt it’s an exciting and upfront performance, the screeching of brakes or the zing of bullets have a hint of harshness about them that can become distracting at volume. We notice this edge softens slightly after around 24 hours of running in, but it’s still not as tonally balanced as leading rivals. There’s a 3D mode on offer with the Klipsch R-20B, and while it provides a wider soundstage when on, it’s detrimental to the sound in other ways, making it too thin and bright. 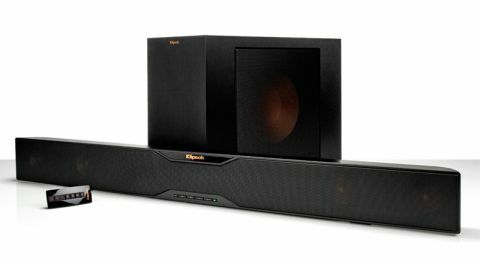 The Klipsch R-20B is a good soundbar that just finds itself in a field of great competitors at this price. We love its powerful and upfront sound, but talented rivals top it when it comes to out-and-out balance and absolute detail.